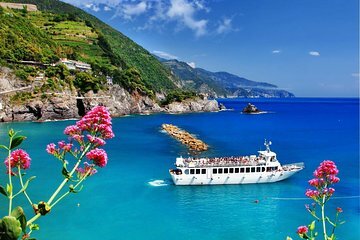 Disfrute de la belleza de uno de los destinos más famosos y fotografiados de Italia en una excursión para grupos pequeños desde Lucca a los coloridos pueblos costeros de Cinque Terre. Admire los espectaculares contornos de la costa de Liguria mientras viaja en tren y en barco entre los pueblos de pescadores en terrazas que salpican la rocosa ladera de la costa. Vea por sí mismo por qué toda la zona ha sido declarada Patrimonio de la Humanidad por la UNESCO. El tamaño del grupo está limitado para disfrutar de una excursión más personalizada. Excursión en grupos pequeños desde Lucca a los pueblos de Cinque Terre, declarados Patrimonio de la Humanidad por la UNESCO. Fantastico, un viaje muy agradable, la guia y chofer muy simpaticas y los lugares recorridos demasiado bonitos, me falto mas tiempo para quedarme en cada lugar, pero volvere. Responsabilidad y puntualidad. This was the best Viatour trip we have ever done. It was small group so we paid more but worth it. Our guide Ariana was the best of the best. She was personable, funny , conscientious, knowledgeable , and overall a great guide. We loved her. The beauty of Chinque Terre was breath taking. I just wish we could have stayed longer at one of the Villages. A reason to go back , right ?? Don’t miss it. Ask for Ariana. Our Guide Alessandra, was very insightful and accommodating . Ample time was given to walk and wonder through each of the towns and taking time to stop for lunch at Monterosso. Would definitely do this tour again. We were very fortunate with the weather on this tour as the sea was calm enough to travel between towns by boat it wouldn't have been the same if we'd shuttled from town to town by bus or train. Approaching by boat gives you a totally different perspective on the towns, which cling to precipitous slopes in a charming fashion. Speaking of slopes, I have to say, having met a large man with bad knees, these are not places for anyone with mobility or weight issues there will be problems in negotiating slopes and many narrow staircases. We had two guides - one for the trip to the Cinque Terre, who was good on local colour and one for Pisa and back to Lucca, who was good on history, so all bases were covered. Four stars, because the trip is highly don't-miss recommended, but I'm not sure what a trip would have to involve to be amazing. The sights were great but we spent far too much time waiting for the boats. In some cases we spent 40 minutes visiting a village and 30 minutes standing in the sun on the pier waiting for the boat. This happened a couple of times, which was frustrating as the day went along. It was a case of hurry up and wait. On the final stop, we were sitting in a park enjoying the views and taking it all in, and she asked us if we wanted to wait in the van seeing as how we were back at the meeting place early. Given a choice of a shady park bench with views of the harbour or inside a hot van we, of course, chose the bench. Disappointed that she seemed to want the day to finish as early as possible. A lovely excursion by small van. Our guide was delightful and the rest of the travelers as well. The boat trip provided the opportunity to see the coast from the sea, and get a better view of all the villages. Because we went in high season I'd hoped September would have had less tourists, the little towns were very full of tourists so it was a bit hard to get a flavor of life there without the mobs ourselves included, of course! of visitors. Our guide and driver made it so the van picked us up in a flat area so we never had to contend with all the steep steps going up to the road. Best tour we did! Our guide was amazing,, the day was perfect! I want to go back! This trip was absolutely outstanding. Our guide, Emilia, was excellent. A great day out. This was a great way to see the area in one day. My husband and I had been to Cinque Terre before, staying in Manarola where we had days to wander about the villages. This time, we traveled by ferry to 3 of the villages and then on to Porto Venera, which we had never seen. Our guide was enthusiastic and personable. The drive from Lucca to the coast was pleasant. The only downside was not having a lot of time in each village. We would recommend this tour to anyone wanting a one-day experience.